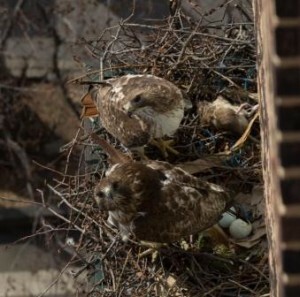 New Parent Red-Tails Come to Tompkins Square Park! The morning of Monday, March 31 started off slowly, but took a quick turn for the exciting when we received a call about the pair of red-tailed hawks nesting next to Tompkins Square Park. After a few years of hosting juvenile red-tails, Tompkins Square Park is finally home to two nesting adults! Karen Waltuch and Leni Stern reported that they have been excitedly watching the hawks from inside the Christodora Building, where the hawks have taken up residence on a 7th-floor air conditioning unit. This young pair is very active—they’ve been flying about the park and putting on quite a show for onlookers in the East Village. Monday’s call from Karen came, however, due to concern that building management and the tenant of the apartment where the hawks have chosen to nest might want to remove the nest. Many people are unaware that hawks, along with their nests and eggs, are federally protected, and that removing them is illegal. In response, NYC Audubon communicated with the building manager to ensure that this nest remains undisturbed, and we have since gotten word that the tenant is in fact delighted to have the hawks nesting right outside the window. The Tompkins Square hawks (we’ve heard that they’re being call “Chris” and “Dora” in honor of their chosen building’s name) are already famous. They’ve been the subject of several blog posts and news articles since they started nest-building in February. Bruce Yolton, who runs the website urbanhawks.blogs.com, had been observing the birds closely along with other City hawk watchers, wondering when the female would finally start laying eggs and brooding, as she is several weeks behind some of the more established nests in the City. Well, yesterday morning we received a lovely photo from Karen and Leni looking down on the nest—and two eggs are clearly visible! We wish Chris and Dora a successful nesting season. Click here to read more about red-tailed hawks in New York City, and learn what you can do to help protect them.